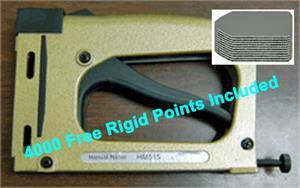 4000 pack of 5/8" wax free stacked hard Framers Points. Fit the Fletcher Framemaster™ both manual and pneumatic. 10,000 pack of 5/8" wax free stacked hard Framers Points. Fit the Fletcher Framemaster™ both manual and pneumatic. 5000 pack of F-18 brads. 3/4" x 18 Gauge brads for use in Salco type brad nailers used as fitting tools. Hard steel nails easily penetrate hard woods. The Logan F500-2 Dual Drive Elite represents the next step in easy-to-use, efficient picture framing point driving tools. Working like a common staple gun, the Dual Drive quickly drives either rigid or flexible points. 2500 Pack of Logan F55 Flexi-Points. Used in fitting frames where it is useful to be able to open the frame package and change artwork.